The empty space above a sofa is a prime spot in the house for a great piece of art. In fact, it's comparable only to space above a mantle. That being said, what kind of art should go there? Should it be a painting? A photograph? While most people stick with the traditional solution of hanging a single painting or photograph above a sofa, there are plenty more options to choose from. When it comes to choosing something to display over a sofa you're only limited by your sense of adventure. So get creative and display something you love! 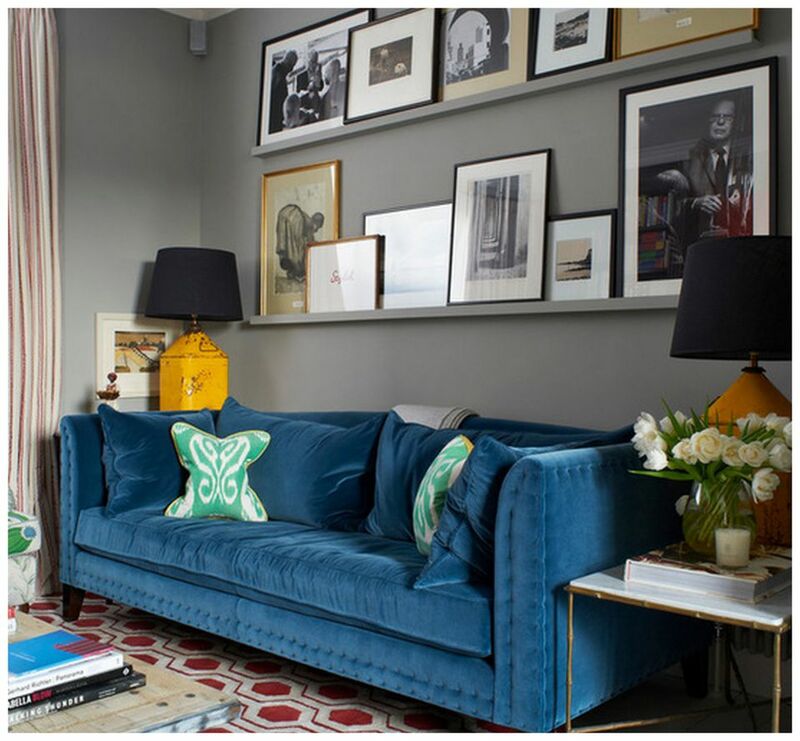 The most common thing to put on a sofa is a single piece of artwork, but if the artwork is bland or blends in with the wall the impact is minimal. If you really want to create an eye-catching focal point, a bold piece that practically jumps off the wall is the way to go. Try something very large in size, vibrant in color, or graphically appealing in design. Ultimately, the term "bold" is open to interpretation, but the idea is that when a person walks into the room their eye is immediately drawn to the piece because it's so striking. Sometimes one piece just isn't enough. This is when gallery walls can really save the day. A photo gallery can allow you to create a really dramatic impact and it saves you from having to choose just one piece. Just remember when hanging pieces to create a gallery wall that all the items together will act as one unit. The center of the entire display should be at eye level. It's always best to plan this type of display before you start hanging. Place the pieces on the ground in front of the wall and play around with the arrangement until you find one that satisfies you. If space doesn't allow for this, use graph paper. These hats come in every color imaginable and create impactful wall art that's guaranteed to stand out in any space, and they're great in modern global spaces. Try using one above a sofa for a simple and stylish focal piece, or display a few together to create an even bolder impact. Mirrors are important decorative tools. They reflect light, they open up spaces, and they just make rooms look better in general. Above a sofa can be a great place to hang a large mirror, but keep in mind that whenever possible mirrors should be hung across from windows or something else that's visually appealing. Don't hang a large mirror over a sofa simply because it's an empty space and you happen to have one. Make sure it works with everything else in the room. That said, you can certainly hang a series of small mirrors together over a sofa to create a gallery feel. Like with any photo wall, treat them as one unit when deciding on placement and carefully consider size, shape, and the finish of the frames. As homes get smaller, storage becomes more and more important, and people are starting to use every available bit of space to display their trinkets and treasures. Shelving placed above a sofa can be a great way to solve a storage issue and creatively display your accessories. Floating shelves are a great option, as are shelves with attractive brackets. Just make sure they're installed correctly so they don't fall on anyone sitting on the couch! When installing shelves, keep all the rules in mind - hang at eye level (or in the case of a grouping the center of the group should be at eye level), and pay attention than the width of the sofa so that the shelves are hung in relation. This isn't to say you can't break the rules depending on what you want for your space, but if you're unsure about placement these rules help. Hanging sculptures made up of interesting materials and shapes can be ideal for creating unique, one-of-a-kind looks. The term sculpture is very broad, but basically, it means any item that isn't a traditional piece of art (i.e. painting or photograph). It could be an interesting architectural piece such as a bracket, a sculptural wall sconce, faux antlers, or anything else you find that speaks to you. The key here is to look for pieces that don't have a lot of depth so they won't infringe on the space out over the sofa. Maps are a fantastic way to add a sense of history to a room. They're also great for paying homage to the places you've been or places you want to go. When it comes to decorating with maps you have a ton of options - colorful, black and white, sepia toned, new, vintage, city, country, transit, nautical - the list goes on. When hanging anything above a sofa, keep in mind that the number one mistake people make is to hang something that's too small. The piece, whatever it may be, should generally be about two-thirds the width of the sofa (unless you're opting for something purposely over-scale). If you're hanging a group of pieces the same rule generally applies. Other than that the rules are pretty loose, so be creative and choose something that speaks to you and makes you smile.